Arkansas-based Lee Enterprises Consulting announced a first-of-its-kind RIN verification program on Jan. 31, known as RIN 9000, to assist biodiesel blenders, producers and obligated parties in verifying the validity of RINs being sold or purchased. Gilbert, Ariz.-based biodiesel producer REV Biodiesel generated more than 10,800 pounds of used cooking oil from kitchens throughout the region during its recently concluded annual Holiday Waste Grease and Oil Recycling Drive, which ended Jan. 13. Toronto-based Pond Biofuels is piloting a unique algae production system at St. Mary's Cement with support of the Ontario government. The system uses LED and solar lighting, and will reduce greenhouse gases by absorbing dirty smokestack emissions. Clean Power Concepts Inc. and Integrated Biodiesel Industries Ltd. of Sao Paulo agreed to merge, pending approval of IBI shareholders and completion of due diligence. Both parties have been working since autumn to determine an integration strategy. A phase of water exists beyond liquid, solid and gas, says UW Prof. Gerald Pollack. Biomat has applied this theory to its work in developing shipping container-based algae growth systems. 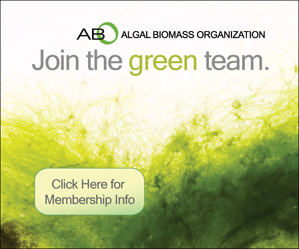 "We focus on the water, not the algae," said CEO Miguel Cizin. Algae.Tec Ltd. made several important announcements over the past month, and CEO Peter Hatfull says the cumulative impact of these developments means that his company is making the transition from a development-stage company to a commercial entity. Life-cycle analysis conducted by the U.S. EPA has determined biodiesel and renewable diesel produced using palm oil feedstock does not meet the minimum 20 percent greenhouse gas emission reduction required by the federal renewable fuel standard. The U.S. biodiesel industry reached a key milestone by producing more than 1 billion gallons of fuel in 2011, according to year-end numbers released by the EPA on Friday. The previous U.S. production record of 690 million gallons was set in 2008. While the USDA Rural Energy for America Program is not specifically designed to benefit biorefining operations, biodiesel plants and other operations that fit the definition of a rural small business under the program language are eligible to apply.